OK. By now you have tried: traps, poisons, shooting them and you even put your lawn mower exhaust pipe into the rodents hole. The Rodent Blaster HS-1 Remote saves you time and money each year by quickly killing the rodent and destroying their tunnel. You would have an annual cost savings on the average of $1250 to $1700 dollars per year that you would have spent on traps, poison and labor. It is not hard to see why our HS-1 Remote solution is the right one! Every other product on the market doesn't destroy the tunnel, leaving your neighbors rodents to move into YOUR empty tunnels. If you leave their tunnel intact, you are wasting your time. 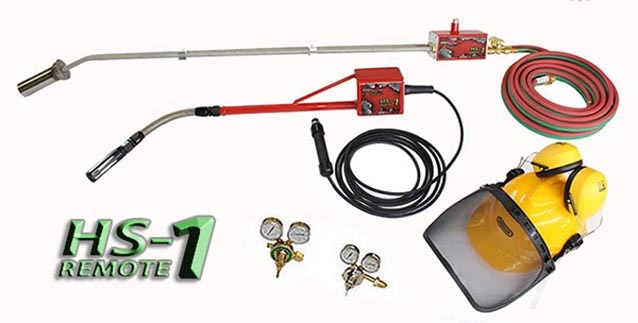 The Rodent Blaster Hot Shot Remote® system quickly eliminates your problem rodents and their tunnels. These guys eat, chew and destroy our yards. The HS-1 Remote is very fast. 10 Seconds of gas, and boom you are done. It uses a precise mixture of propane and oxygen with a remote detonating device to exterminate the pests and their underground homes quickly, safely and humanely. It is safe for the environment and will not harm pets and wildlife unlike dangerous poisons and traps. 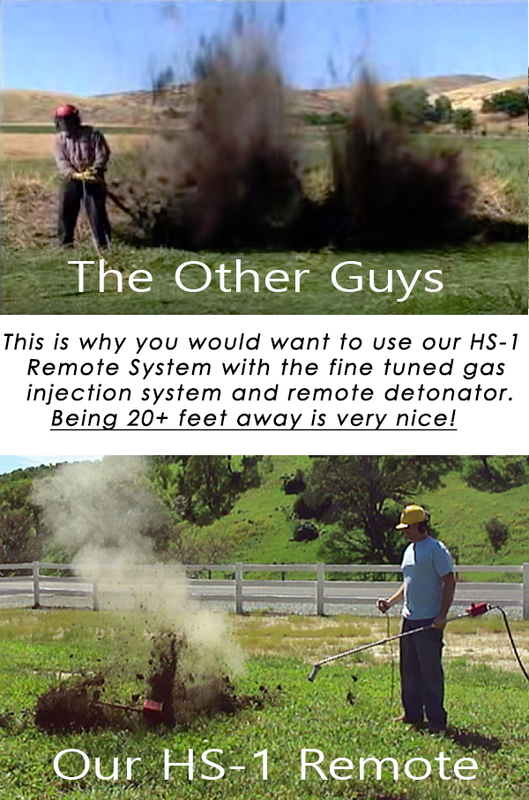 The cost to operate the Hot Shot HS-1 Remote is only pennies per blast. Full 3 Year Limited Warranty. The fastest and best gopher and rodent control system available. Why Buy Our HS-1 Remote? Our Customers Only Have 2 Stages Of Grief: 1. Anger 2. Revenge. Usually by now you have tried many things to kill these persistant digging machines. Our solution is our Made In America Rodent Blaster HS-1 Remote which allows the user to be 20+ feet from the rodents hole when you ignite the gas mixture. The Rodent Blaster™ HS-1 Remote is an organically safe very easy to use pest control system for gopher control, ground squirrels and other problem destructive rodents. The Rodent Blaster™ HS-1 Remote will control and eliminate the tunnels and the problem ground squirrels, gophers, ground hogs, moles, voles, prairie dogs, badgers and all other rodents that eat, chew, dig and destroy our yards. We have had 17 years to develope our latest HS-1 Remote system. Try Before You Buy.......No Risk! Rodent Blaster® now offers a rental service for those who are not yet sure they want to purchase their own Complete HS-1 unit , but they still have a need for rodent control. It comes to you complete and ready to use ( with your propane and oxygen tanks ). You can now rent a complete Rodent Blaster HS-1 System for only $69 dollars a day!. If you then decide to purchase our Hot Shot HS-1 package then you will get 100% of the rental price off of your HS-1 purchase! It uses a precise mixture of propane and oxygen with a remote detonating device to exterminate the pests that live in underground tunnels and burrows quickly, safely and humanely without any dangerous poisons or traps. It is safe for the environment and will not harm pets and wildlife unlike dangerous poisons and traps. The cost to operate the Hot Shot HS-1 Remote is only pennies per blast. Full 3 Year Limited Warranty. The best Gopher Control System Available.